Optical coherence tomography (OCT) is a non-contact, non-invasive technique that scans the structure of your eye and creates a 3D image of every detail, including aspects that cannot be investigated by other methods. In most cases it is able to detect structural damage before patients notice problems themselves so that subsequent treatment may arrest any loss of vision. OCT is also a fantastic way to monitor corneal pathology and the fitting of soft and rigid contact lenses, from the most simple to the most complicated. Innovative Eye Care has two spectral-domain OCTs available for use at both our Adelaide and Woodville practices, and we consider them the ultimate tools for diagnosis and early detection of eye disease and retinal conditions. As of September 2017, Innovative Eye Care in Hutt Street are the proud owners of a brand new Heidelberg Spectralis OCT and Heidelberg Edge Perimeter for visual field testing. This state-of-the-art OCT technology enables your optometrist to obtain incredibly high-quality images at significantly increased speeds. The Heidelberg Spectralis OCT has a scan rate of 85,000 Hz and additional eye-tracking technology to improve the precision and repeatability of these scans. This is particularly important when monitoring patients for subtle changes over a long period of time. 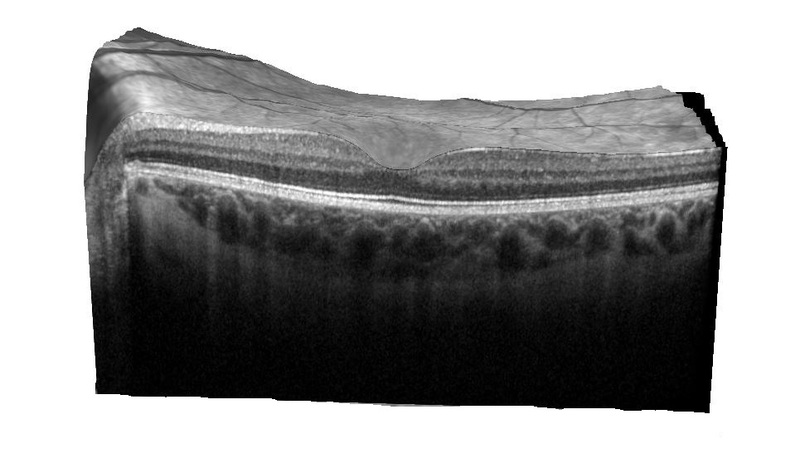 CAPTION: A 3D OCT scan of a healthy retina. Together with the visual field information, your optometrist can assess the structure and function of your retina and peripheral vision with increased accuracy of diagnosis. These features are especially beneficial for providing a more complete picture of glaucoma management and can impart better education and understanding for you, the patient. OCT is particularly useful to scan the layers of the retina to look for subtle and sometimes not-so-subtle eye disease. Signs such as swelling of the retina, traction from membranes, loss of photoreceptors due to atrophy and intraretinal bleeding can all be seen in retinal scans. OCT enables easier diagnosis of potentially sight-threatening conditions, can help to monitor conditions like macular degeneration and diabetic retinopathy, speed up a referral to a specialist, and facilitate effective management of many eye conditions. OCT is also useful for examining the optic nerve for early signs of glaucoma and other optic neuropathies. At Innovative Eye Care we recommend every patient over the age of 50 should have a baseline OCT scan done of their retina so that we have a reading to compare future results with, should the eye change. Patients should be aware that an OCT scan does not attract a Medicare rebate and extra charges may apply for this service (we are happy to offer this at 50% off for pensioners and students). Please see this page for billing information. OCT has primarily been used by optometrists and ophthalmologists in the examination of the posterior pole, macula and optic nerve head. As OCT becomes a more regular feature in optometry practices, more equipment suppliers are bringing new models to our shores. Many of the latest OCT machines, although primarily designed for imaging the posterior segment, are capable of both anterior and posterior eye segment imaging. CAPTION: Anterior OCT displaying the anterior eye anatomical structures. With the ability to image the cornea, limbus, sclera, anterior chamber and contact lenses on eye, OCT is an invaluable tool in contact lens practice. Some OCT machines use Scanning Laser Ophthalmoscopes (SLO) rather than infrared to directly view the fundus and anterior chamber. In contact lens practice, SLO is a bonus addition to OCT, giving a high quality view of the tear film and contact lens surface. OCT can be used for the examination and imaging of thickness and fitting characteristics of soft contact lenses, in particular high plus, high minus and toric lenses. Soft contact lens edge profiles can be assessed and lens-edge interactions with the sclera accurately visualised to better understand how the lens fits on the eye. Lens thicknesses can also be visualised and assessed, as well as the presence and degree of any prism ballasts used to stabilise toric lenses on the eye. In bespoke contact lens modalities such as RGP, ortho-K, and scleral, OCT imaging adds another dimension to the examination, specification, and management. Rather than solely using keratometry data, many lens designs use sagittal height to calculate lens measurements. While biomicroscope techniques and corneal topography can calculate corneal sagittal height and anterior chamber depths with reasonable accuracy, OCT can do much more with higher resolution examination and increased measurement accuracy. Even epithelial thickness can be monitored as it is molded in ortho-K treatment. Conditions where anterior OCT is useful in optometry practice include keratoconus, corneal graft, pellucid marginal corneal degeneration, recurrent corneal erosion, epithelial basement membrane dystophy, Salzmann’s nodular corneal degeneration, pterygium and pingueculum. OCT also allows better management of contact lens complications and differential diagnosis of corneal abrasion, microbial keratitis, and other corneal pathologies. CAPTION: Anterior OCT of a patient’s anterior chamber angle. This is an important assessment for anyone at risk of glaucoma.